A Quick 4 Year Update! I’ve changed in more ways than one since my gastric sleeve surgery four years ago! The mental and physical changes still amaze me this day. My journey to a healthy life is always evolving and for that I am ever grateful! Life is a bit crazy these days with a move in the works. While we’re only moving 30 miles away, it’s a bit more difficult when you’re moving to an island! As soon as we’re settled, I promise I’ll have a more detailed post of my life at Down the Scale. 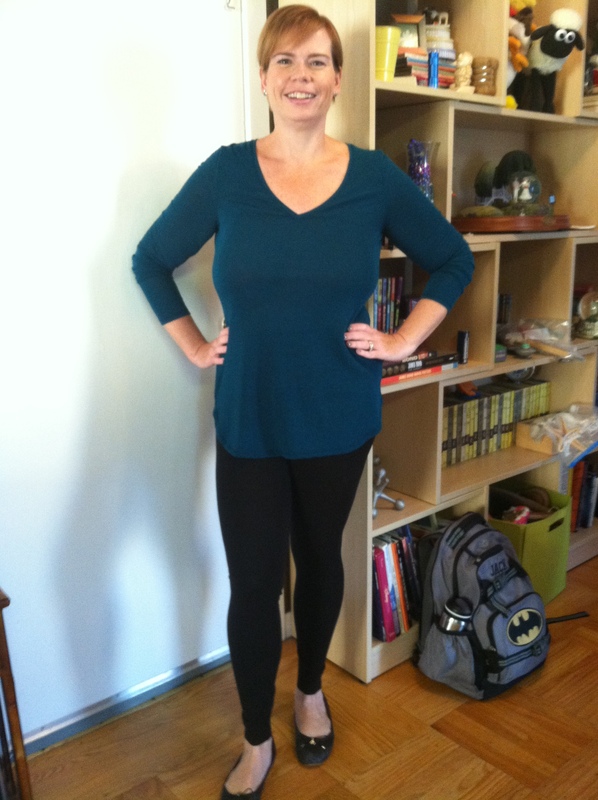 In the meantime, I wanted to note that it’s been four years since I had my gastric sleeve surgery. This year as been full of ups and downs, literally and figuratively, but I still believe that surgery was the start of a much better life for me. I am healthy in more ways that I can measure. There are always challenges in life, but I feel more prepared to tackle them since I began my journey to what is now a healthy life. How could I not be engaged with these people? The ups and downs of my weight loss journey reminds me to remember what is really important: making your life a priority. For me, spending more time with my family is my top priority! I hear these words for an hour twice a week now that I workout with my trainer, H. Dedicating two hours a week to exercising with the guidance of a trainer is helping me improve my physical health, but focusing on my physical core made me think about my core in a mental sense. What I mean is that for my body to work better, I need to engage my core to support the rest of my body no matter what exercise I’m doing. It’s also my mental core that needs engaging as well these days. The past few weeks I felt unfocused, like I was going through the motions of life, but not really feeling it. I have all these goals in my head, but I wasn’t working toward any of them. Sure, I’ve been eating better and exercising more, but I still didn’t feel fulfilled. It wasn’t until my training session last Thursday when H. reminded me to engage my core muscles that it hit me. I’m not engaged in anything. Now, I’m not saying I’ve just ignored my family, friends, and my life in general during here last few weeks, but I haven’t felt involved. Besides the goals of being healthy I have other goals, but I haven’t made them important. If I don’t make my goals a priority, how will I accomplish them? Unless there’s a magic wand somewhere that I don’t know about, I need to work toward my goals instead of talking about them. *Being confident in my physical self is a must, no matter what happens. As I mentioned in my last blog, I do feel stronger and more confidant in my athletic abilities, but I took a step, well, a run back, two weeks ago. I was doing fast laps around the YMCA and my first one went great. The second set was two laps, but halfway through the second lap I just stopped. It felt like my body couldn’t go on. I was winded and my legs cramped. I was angry with myself. I finished the training session, but it bothered me the rest of the day. Normally, I would have let it go and just waited until my next training session to try again. Instead I went to the gym early the next morning and ran without stopping for a mile and a half like I’ve been doing. Instead of acting like I was going backwards in my training, I tackled the problem head on. I was engaged. I will continue to be engaged in my athletic endeavors no matter if they’re good or bad. *Making my goals a priority, even if it means saying no. I’ve put off building a new career for the past year. 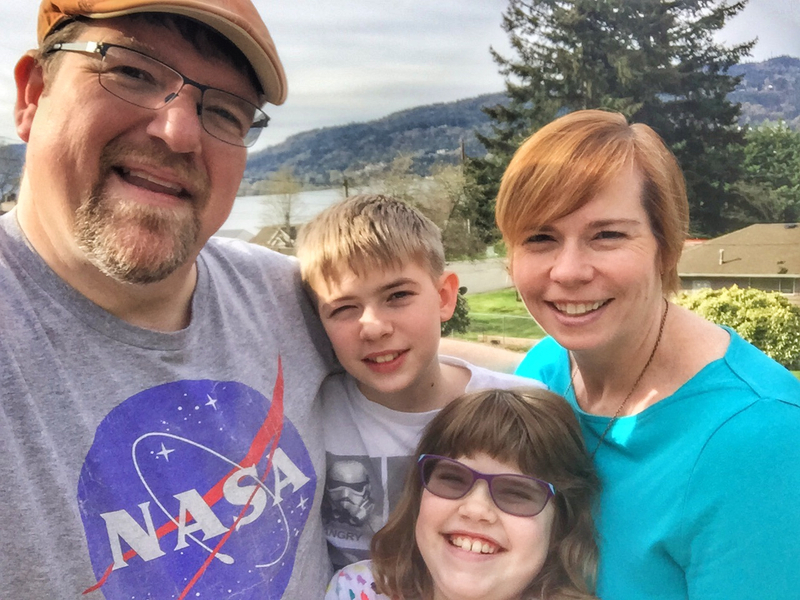 Sure, at times, I had to put my goals aside to work on immediate issues like moving to a new state and setting up our new life in the Pacific Northwest, but we’ve been here almost six months and we’re pretty settled. Each day I come up with excuses not to make the time to work on my writing with the exception of a blog entry here and there. No more excuses! I am now scheduling in time to work on my writing which includes my blog and my fiction writing. I’m doing this even if I have to say no to meeting a friend or pushing housework aside for another time. As I type, I’m at a café while my daughter is at a theater class. This is my dedicated writing time; no running errands or playing Words with Friends. I am engaged in my writing, which in turns means I’m engaged in my personal and professional goals. *Spending time with friends and family is essential. I realize that I’m with my children a lot, but I’m not always “there.” While I’m not quite sure which games my kids are talking about, I am trying to listen intently. If it’s important to them, I need to make it important to me. I’ve realized if I’m not engaged when they’re talking about everyday things, I might miss the important life stories they’ll share. And with my ever-supportive hubby, I need to be with him in addition to our time as a family. We’ve made the effort to go out to dinner and breakfast on our own and having this time alone with him is necessary. It’s easy to get wrapped up in our lives as parents, so to spend time as a couple keeps us engaged in our marriage. I can’t forget my friends, either! So many of my friends are far away and while an email, text or Facebook post helps enormously, FaceTime is my new favorite app. During a “woe is me” moment, I texted my constant cheerleader, N., to see if we could schedule a FaceTime appointment. We video chatted yesterday and it really lifted my spirits. Seeing her face while talking was just what I needed and I realized much of it was because I was focused just on our conversation. I wasn’t texting in between loads of laundry or running out the door to an appointment; we were focused on talking only. When I am focused on the person I’m talking with and not trying to multitask, I am engaged in my life as well as this person’s life. 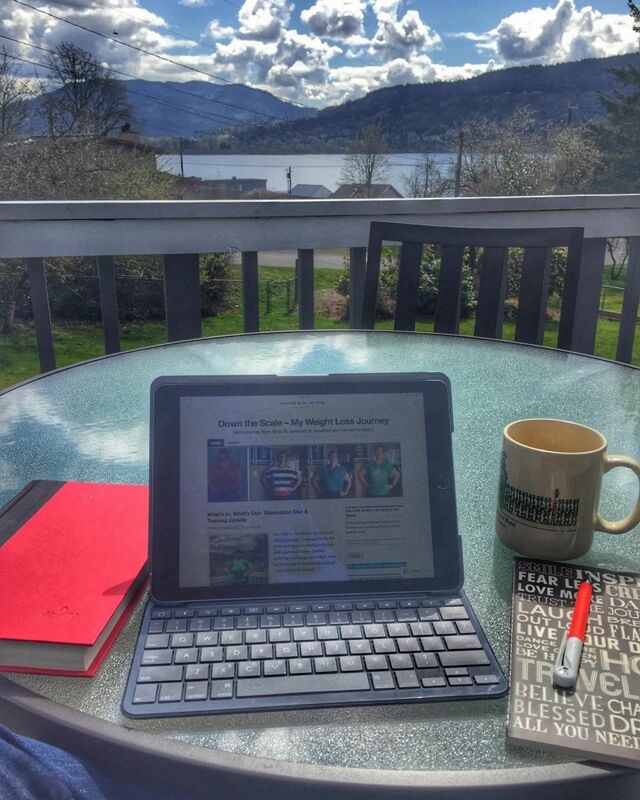 Making the time to write is one of my goals and by setting up outside in the occasionally clear day in the PNW, I can write. No excuses, it’s time be engaged. Since I started my gastric sleeve surgery journey over three years ago, I’ve been fortunate to have friends who encourage me to keep active. My friend, N., started me on running journey even before I had surgery, and she continues to encourage me to try different workouts like spinning. My other friends like A. and R. ran races with me and I even ran my first half-marathon with my college and adult friend, B. Now that we’ve been in our new hometown for a little over a month, I’ve struggled with keeping active. Instead of walking my daughter a half-mile to school each way, I walk down the street to the bus stop. I am still unpacking and getting settled into our new place, so I’m not running as often as I like. With winter approaching, I was concerned about keeping active. Running in 30 degree weather doesn’t sound as appealing as sitting in front of the fireplace with a cup of coffee, does it? As I’ve shared many times, my weight loss journey is just that…a journey. It’s not just about weight loss, but about continuing to strive for the best me I can be. I realized that if I want to continue to keep the weight off and improve both my physical and mental health, I need to be proactive. Last week the family joined the YMCA and today was my first visit. I knew from previous experience, the Y is a great place to workout and meet people. When we moved to Florida when my oldest child was an infant, the Y became my go-to place. And even though I was obese then, I kept active, albeit slowly, and I met other stay-at-home moms. Finding a community, especially with little kids, was my saving grace. I finally committed to using our new membership this week and I was fortunate enough to have a new friend show me the ropes. While volunteering at my daughter’s school a few weeks back, I meet another mom, S., who mentioned she belonged to the Y. We made plans to meet today and I am so grateful we did! To make a new friend in a new hometown is always a relief and comforting, but to make a friend who also likes to work out and has a positive energy and spirit is even better! S. was kind enough to show me all around the Y after we walked about three miles on the indoor track. We’ve even made plans to try out the pre-masters swimming program in January. I am so thankful to have found someone who is active like my San Francisco friends. Here is my driver license photo from 2011, pre-gastric sleeve surgery. Not a bad photo except for the extra 100 pounds I weighed! This is me from 2011. It’s obviously pre-gastric sleeve surgery. It’s actually not a bad photo except for the extra 100 pounds I was carrying. I can avoid the hells of the DMV and just live with this photo another five years. So why am I even contemplating renewing my license in person? Of course, it’s all about the photo. It’s an upsetting reminder of the literal and psychological weight I was carrying. Sometimes I forgot who I was back then. I have many friends tell me that they just think of me as I am now: healthy and happy, not the obese woman who hid so many painful feelings. And on a practical note, it causes delays when I present this ID at the airport or for any type of verification. I get a few raised eyebrows when I give my ID to someone, but I’ve just learned to smile and say I’ve lost weight to keep the line moving. A new photo will represent the new me. The healthier and happier me. I would say a new picture would show the person I am striving to be: the woman who does her best to be treat her body and mind with the respect and nurture she needs. I will always be a work in progress, but I think my current photos show me as the person I want to be and not just an obese woman. Because let’s face it, when you look at a picture of someone who is obese, most people notice the obesity first, if they can even look past it. Besides avoiding the DMV, why would I consider keeping this photo? Well, it’s a good reminder of how far I’ve come. Yes, I am proud of my success, but honestly, I struggle every single day with food. I am embarrassed to say I’m still struggling with the holiday weight gain. I’m letting stress and fear get in my way. I am working on it through exercise, positive reflection, more mindful eating, and a bit of good old-fashioned prayer. Looking at my driver’s license photo is tangible proof of my success. More importantly it’s a reminder of where I’ve been and gives me the encouragement to continue focusing on my weight loss journey. 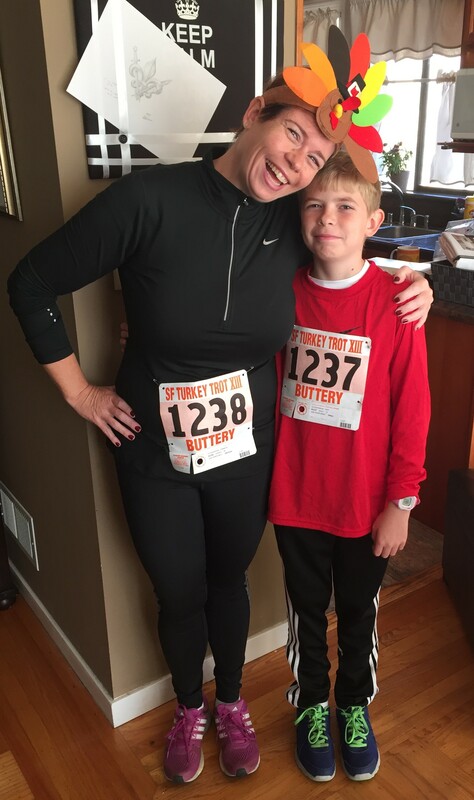 From 2012 to 2015 and from 5K to 5 Miles, the Turkey Trot continues for me! Just like my gastric sleeve journey continues! How can I say that? I’m over a 100 pounds lighter than my first race and I’ve run farther than five miles on regular workouts and even ran my first 10K this past Spring! Well, sometimes things don’t go the way you plan, but if there is one important thing I’ve learned in my gastric sleeve journey is that you have to remember that sometimes trying is more important than succeeding. Now this isn’t to say that I don’t consider the 2015 Turkey Trot a success. My running mantra is and always will be “You just have to finish!” So I did finish the race and with a respectable time, but it wasn’t the time I wanted. My first two miles went really well and I ran at a great pace and I ran more than I walked. Yeah me! Then the pain started. Sigh. At first I thought the pins from my racing bib were sticking me in the stomach. I even checked! No, it was abdominal muscle pain. I was so frustrated and confused. I’ve run longer distances the past few months so I wasn’t sure why my muscles were strained. Finally, I realize that if I could still walk, I must be OK. I shook off my drama queen attitude and straighten my turkey headband. “All I have to do is finish” was my battle cry! I managed to run and walk the next three miles and finish about the same time as I did last year. My abdomen would not defeat me! Well, actually it was more of my “Debbie Downer” attitude that would have been my downfall. Yes, I was disappointed and frustrated, but I finished! And to have my friend N. waiting for me at the finish line as she has done for the past four years, I couldn’t help but smile. And then I found my son, who naturally finished way ahead of me, I was happy once again. My abdominal muscles were sore the rest of the day, but I recovered with a bit of rest and pain relievers. And the knowledge that I kept true to one my weight loss slogan of “You just have to finish!” made me happier than a piece of pumpkin pie. Really, it’s true! One of the best parts of running is having my son join me at races! He did his first Turkey Trot this year and next up is the Santa Run! 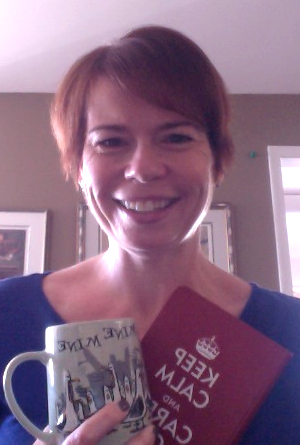 Here I am with my writing practice inspirations: my journal and coffee! This past weekend I went to a writing seminar. Not only was I inspired to create a writing practice, I was reminded that I had already created a weight loss practice. It’s this routine that I developed after my gastric sleeve surgery that is keeping me healthy and happy. The writing instructor shared many helpful and insightful writing information, but one hint he shared really struck home. He mentioned he liked to keep one of his favorite books on his desk when he writes. His favorite author inspires him. Sometimes he reads from the book to get ideas, but not to copy. It reminds him of different aspects of writing such as structure, word choice, etc. Surrounding himself with his inspirations and influences keeps him writing. As he told this story, I realized I am already doing this with my weight loss journey. Since my surgery, I made the conscious effort to make my surroundings healthy. I believe it is one of the biggest reasons for my success. What are these positive things I surround myself with? The first is food. Out with the bad, in with the good. Soda, junk food, fatty food had to go. No, I’m not an angel by any means. As I write, a pan of chocolate drizzled rice crispy treats are in my kitchen. They are leftovers from the ones my daughter took to a school event. Am I going to have one today? You bet! It’s a treat, not a regular food choice. The rest of the my food choices today will be healthy, especially when I know that large amounts of sugar make me ill. I am surrounded by better food so that what I choose now is what I truly want. Exercise is another positive aspect of my life. When I don’t move, I am cranky. Trust me, I know I am. Even if I’m just walking my kids to school I am a happier woman. Now running is a passion. I’m still a solo runner, although I am getting closer to running, and hopefully chatting as I run, with friends. I really enjoyed the 5K races I completed. Even though I’m not running and talking with people during the race, I am inspired being with people who are putting themselves out there. Whether these people are competitive runners or determined walkers, they give me a sense of affirmative energy that I love. This is one of the reasons I signed up for another 5K race less than a month after my last race. When you find something that makes you happy, you keep reaching for it. This leads me to the third thing that makes my surroundings healthy: choosing positive people to keep in my life. Naturally, I can’t control who I am in contact with 100% of the time. I have learned it’s OK to keep my interactions with negative people to a minimum when possible. I am a firm believer that positivity breeds positivity. When I’m with people who are interested in me, who encourage and support me, and see the light and humor in life, I feel better about myself. Hopefully I offer the same to my family and friends. I don’t believe a person needs to be perky and positive all the time, but if your first thoughts are always negative, how can you let in positivity? I continue to struggle with anxiety and depression and I know I always will since life is full of family drama, financial issues and just plain old unhappiness. I feel like I handle these struggles quicker and better because I have a positive, strong network in place to help me in my continuing weight loss journey. I will take my writing instructor’s advice to surround my writing environment with things that inspire me. For me this means a cup of coffee, my journal and stacks of books that I love and ones I want to read. To lose weight and maintain my mental and physical health, I surround myself with good food, exercise and positive people. I plan to apply my positive weight loss environment method to my writing practice and hopefully other areas of my life. I look forward to a successful writing practice and healthy lifestyle as I continue to preserve my happy surroundings! Two weeks after my incisional hernia repair and tummy tuck, and I’m up and going! It’s been two weeks since I made another “investment” in myself. 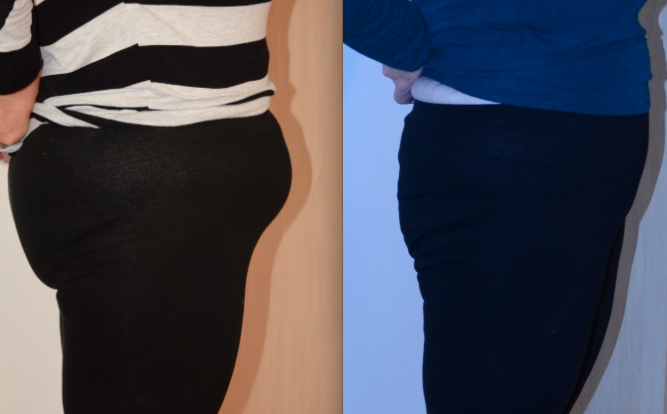 I’m recovering from my abdominal hernia repair and tummy tuck surgeries relatively well. I’m sore, tired and emotional, but I’m slowly getting back to normal. I thought this recovery would be easier than my gastric sleeve surgery, but I’m not sure that it is. The physical pain is worse and the emotional aftermath is more than I anticipated, but just as I knew my sleeve surgery was worth it, I feel the same way about this surgery. The past two weeks are just another part of my journey to a healthier me. So, let’s go back two weeks ago. The ever-supportive hubby and I arrived at the same hospital in the morning. I was excited, nervous and dying for a cup of coffee. Not eating before surgery is easy, but no coffee is torture. I forgot my coffee desires once I went back to pre-op. This experience was easier than last year’s experience. Losing 100+ pounds makes an IV go in a lot easier and quicker! The strangest part of pre-op was having my plastic surgeon, Dr. C., take a Sharpie pen to my body to mark the incisions and areas where he would remove the skin. The reality of my future body hit me. I would have a “normal” stomach. The reality of the future pain also dawned on me as I saw how much he skin he would be taking. To distract myself from that thought, I asked Dr. C if they would weigh the skin they removed. OK, I know it sounds gross, but wouldn’t you want to know? He promised me he would let me know. Finally, I went in the operating room and I was out before I knew it. I’m not sure what my surfer-dude anesthesiologist gave me, but I went under quickly and I woke up in the recovery room feeling great. My nurse kept the good feelings going with a cup of delicious ice chips. My mood continued with Dr. C walking in. My hernia surgeon, Dr. J, finished his part first, so Dr. C was there to check on me and call my husband with the results. Everything went well according to Dr. C. I was thrilled to have my hernia repaired, my intestines put back into place and the skin removed. Dr. C. gave me the number I asked for…three and a half pounds of skin and fat removed! Yikes! No matter how much exercise I did, I would have never worked that off my stomach. Unfortunately my good mood faltered once I got to my hospital room. My poor roommate was in pain after whatever surgery she had and she didn’t speak English. She and the great nurses managed to communicate when her family wasn’t there, but it made for a chaotic setting. It did distract me somewhat from my own issues. The nausea set in as soon as I settled in my room. I do not handle the IV pain medication well. I must have had my own language issues because I couldn’t get the nurses to take me off it They would give me anti-nausea medication thankfully, but it made for a long night. The next morning the hubby joined me at the hospital. Once Dr. C and J., Dr. J’s physician assistant come by and told me I needed to stay another night, I sent Dave home. I learned from my sleeve surgery that I needed to sleep as much as I could so Dave didn’t need to keep me company. Also, I felt better having him home with the kids. Much of my surgical anxiety comes from my children’s emotional well-being. Knowing Dave was with them helped me. So, I was stuck another night at the hospital. I was not a happy camper. Just when I was resigning myself to another night of nausea and noise, an angel appeared. I didn’t think it would be in the form of a tall, slightly German accented man. This nurse happily took me off the IV pain medication. Nurse A was my hero! He switched me to a liquid painkiller, which even with its rock candy dipped in Kool-Aid flavor, was 100 times better. The nausea went away and the neon green lime jello was finally appealing. When Dr. J and J, the physician assistant, arrived the next morning, I was sitting in a chair chatting with Dave. They smiled and said I looked like I was ready to go home. Yes, I was! Of course, it’s never that simple. I kept hearing that line from the song “Hotel California”, “You can check out anytime you like, but you can never leave.” Nurse E needed discharge papers from Dr. C and he was in surgery. Can I tell you how wonderfully persistent Nurse E was for me? She called, she texted and she kept calling until she received the discharge information. She and the hubby helped me get ready to go home which included finding an easy way to get dressed with my drains. Yes, I was sent home with two drains, one near each hip. From what I understand, they are there to help with recovery, but I found them to be a huge pain and gross. I now have more sympathy for men and their external genitalia. These bulbous shaped drains were pinned to my shirt, but they bounced around and I was always worried about sitting on them. Finally, I was home to see my babies! My ten-year old’s smile was beautiful and soothing. My six-year-old managed not to squeeze me like she normally does and it was her glowing smile that made me feel warm and fuzzy. And all the “pretty things,” like her butterfly nightlight and flowered shaped trinket box, she insisted on giving me from her room, kept the mood light. So I was home with my spectacular family when the reinforcements arrived! My always thoughtful friend, N, organized a group of friends to help pick up my kids from school and bring dinner. We were spoiled by all the generosity and help. It was just another reminder of how lucky I am to have such a special group of friends. Here is my abdomen on the day of surgery and two weeks after. What a difference! I can’t wait to see what it looks like when my tummy isn’t swollen and is completely healed! Impressive, if I may so myself. I cannot wait to see what it will look like when I heal completely. I know I will never have the abs of a supermodel, but I don’t care! I just want to have a “normal” body. So here I am healing and finally getting out and about. I am nowhere near 100%. I tire easily. I am very sore. My incisions itch now and then and they’re still gross to look at. I didn’t expect to be so emotional, but some days I am weepy. I think it’s because I feel a bit helpless and unproductive. In theory, it sounds great to lay around and rest, but after a while it is surprisingly depressing. I never thought I would have strong urges to get up and clean and organize my house. Who knew I would have laundry withdrawal? Hopefully, these cleaning and organizing urges will be around when I’m allowed to resume normal activities. I’m listening to my surgeons and my personal doctor, Dr. Hubby. My ever-supportive husband is incredible. He is handling his normal responsibilities plus mine while taking care of me. Once again, I realize how lucky I am to have him as my partner in my journey. Just as I took charge of my health in June 2013 by having gastric sleeve surgery, I am happy that I took charge once again and had the hernia repair and tummy tuck surgeries. Every choice I make that improves my health is worth any pain, depression and nausea if it gets to me to my final goal: being the healthiest and happiest person I can be.